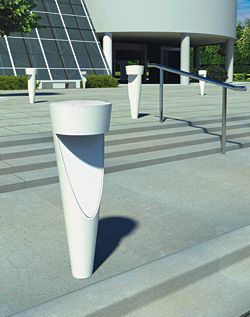 Bollard’s inverted shape provides glare-free illumination for pedestrians. The Tornado bollard model TNA has asymmetric light distribution for pathways, curbs and driveways where perimeter lighting is needed. The TNS model has a symmetrical light pattern. Either model can be specified for metal halide, HPS, CFL or LED systems.